It began with a dream, and a memory. Faith Spotted Eagle slept. In her sleep, she saw her grandmother, lying on a table, wrapped in a blanket with her white braids on her chest. Her sister appeared. “What’s going on?” Spotted Eagle asked. A door opened; a room full of people, ancestors, stared silently. She felt in their stares a sadness, but also a strength. Another door opened to another room with the same scene. She knew that if she were to keep opening doors, all the rooms in the house would be filled with those watchful, silent ancestors. Spotted Eagle closed her eyes, unsure of what do to, but knowing that it was impolite to stare back. Then her grandmother’s voice came to her. That’s when she woke up. Spotted Eagle is a Dakota/Nakota elder of the Ihanktonwan tribe in South Dakota. She wears skirts that brush her ankles, and her white braids hang over her shoulders like her grandmother’s — but when she puts on sunglasses, she looks like a badass. She didn’t know exactly what the dream meant, but she believed it was the answer to a problem she’d been thinking about for some time: How to prevent the Keystone XL pipeline from going through Lakota traditional territory, sacred land. She prayed. And then she remembered the 1863 treaty between the Ihanktonwan and the Pawnee that was the first recorded peace treaty between tribes. She also remembered that, throughout the last several decades, alliances of natives and non-natives in the northern Plains had formed and re-formed to defeat threats to land and water. 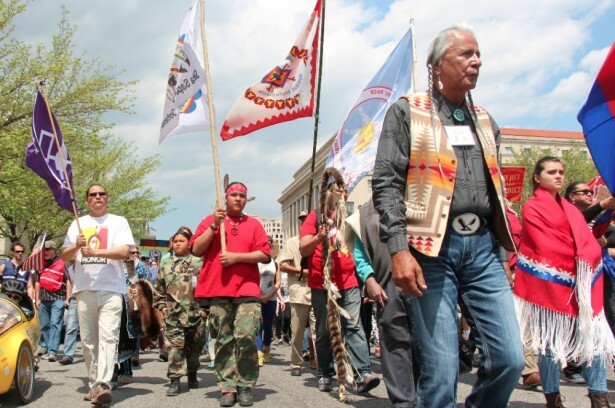 Recently, Lakota elders had made moves to resurrect a new Cowboy Indian Alliance – this time, to take on Keystone XL. In late January of 2013, exactly 150 years after the signing of that first treaty, Spotted Eagle and other activists convened tribal representatives from across the continent on the Ihanktonwan reservation. Their purpose was to ratify the International Treaty to Protect the Sacred from Tar Sands and Keystone XL, a document based on that first 1863 peace treaty. It represented unprecedented unified action from North American indigenous people, with one new addition: This new treaty also included a few of the ranchers from the Great Plains, who feel their lands are also threatened by the tar sands pipeline. Spotted Eagle told the visitors of how landowners and tribal members had come together in the past, and how they had successfully driven industry off their land. This was a version of the cowboy-Indian story these cowboys hadn’t heard. Meanwhile, Jane Kleeb — an organizer of landowners with Bold Nebraska — was also looking for support for her small but somewhat isolated band of dissidents back home. Phone calls flew back and forth between South Dakota and Nebraska. Kleeb brought ranchers north to meet with Spotted Eagle and other indigenous leaders; the visitors were nervous and polite, unfamiliar with tribal customs – yet it became clear that they were connected by this pipeline, as well as everything they stood to lose if it went through. An alliance looked promising. While native/non-native alliances have been forming in various places to prevent all kinds of industrial projects, it is Keystone that has galvanized the environmental movement in a way not seen since the anti-nuclear campaigns of the 1980s. The fight has sparked hundreds of marches, rallies and legal challenges, as well as one of the largest mass civil disobedience actions in the history of the environmental movement. Time magazine wrote in 2013 that it was turning out to be a watershed, the Selma and the Stonewall of the climate movement. That remains to be seen. What’s certain is that the campaign against Keystone has already altered the political landscape. The environmental movement has long come under criticism for being led by the so-called Big Greens — largely white, middle class membership groups whose interests don’t often represent those actually living in the frontline communities where the pipeline will be built. But the coalition of cowboys and Indians offers a radical departure from this history. Moreover, it is a model of relationship-based organizing, rooted in a kind of spirituality often absent from the progressive world, and — given the role of indigenous leaders — begins to address the violence of colonization in a meaningful way. It may be that these so-called unlikely alliances offer the only chance of forging a movement strong and diverse enough to challenge a continent’s deeply entrenched dependence on fossil fuels. 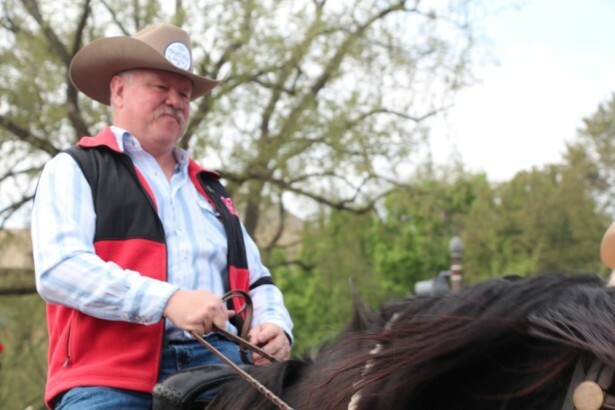 The day after Nebraska rancher Bob Allpress rode through the nation’s capitol on horseback in a cavalry contingent of ranchers and tribal members, he was a little stiff. He doesn’t ride much anymore. But Allpress, with his bandana, boots and well-groomed mustache, still looks every inch the cowboy. When the pipeline route through Nebraska was changed in 2012, ostensibly to avoid the ecologically sensitive Sandhills, the newly proposed path now cut straight through the Allpress’ alfalfa field. If built, the pipeline would lie just 200 yards from their house. This is no ordinary pipeline, just as tar sands is no ordinary oil. According to a Natural Resources Defense Council report, tar sands oil is 3.6 times more likely to spill than regular oil. It is also highly corrosive and nearly impossible to clean up. Residents who live near the path of Keystone 1 — a smaller, already existing tar sands pipeline operated by TransCanada — know this story already. They saw 14 spills — along its route from Canada to refineries in Oklahoma and Illinois — during the pipeline’s first year of operation. The southern portion of the Keystone XL has already been built through Texas, in spite of grassroots resistance; now, the last northern section remains. Allpress fears that a tar sands spill would contaminate his land and water, rendering it unusable for years to come. TransCanada used what Allpress calls “the old slap and tickle” when it notified him that the pipeline would go through his land: a nice offer of some compensation up front, but a warning that under the law of eminent domain, the pipeline would go through no matter what. But cowboys don’t like to be pushed around. So they told TransCanada to shove it, and joined Bold Nebraska, a four-year-old organization led by Jane Kleeb that has emerged as one of TransCanada’s most formidable obstacles. When Bold Nebraska began partnering with tribes in South Dakota, the Allpresses were on board. They’ve since attended their first tribal council meetings, gone to rallies and public hearings, and written op-eds to Nebraska papers, refuting what Allpress calls TransCanada’s massive public relations campaign. Environmental activism isn’t exactly what the Allpresses had in mind when they returned to Nebraska to retire from careers in government and the military, and investing what they had in their land. In one corner, the Allpresses were getting advice from fellow rancher Julia Trigg Crawford from Texas. She’s been fighting Transcanada for years — despite having to concede temporary defeat when the pipeline was installed and began pumping oil through her family’s property. Crawford filed suit and is now waiting for the Supreme Court of Texas to take up her case. “I’m going down swinging,” she said. The pipeline fight may be these people’s worst nightmare, but it has fostered a sense of kinship. All along its path, communities are uniting under a shared narrative of fossil fuel exploitation and resistance. Similar patterns are coalescing along the paths of the other tar sands pipelines around the continent, from Vancouver, British Columbia to Portland, Maine. Like the Cowboy Indian Alliance, partnerships between natives and non-natives have emerged to fight tar sands — and it’s part of a larger trend right now across regions and environmental issues. Zoltán Grossman, a professor of Geography and Native Studies at Evergreen State College, has written extensively about such alliances, pointing to examples of tribes and fishermen who prevented dams and logging in the Northwest, as well as Western Shoshone and ranchers who fought bomb testing in Nevada. In recent years members of the Unist’ot’en clan in British Columbia have invited busloads of non-natives from all over Canada to help prevent a slew of tar sands and gas pipelines from crossing their land. The Cowboy Indian Alliance isn’t alone. Fossil fuel fights are also bringing together tribes within the indigenous community, some of whom have never had a formal relationship. The tar sands cover parts of Alberta which various First Nations call home, and Crystal Lameman’s Beaver Lake Cree First Nation is among them. Lameman spent much of the week in Washington flanked by Faith Spotted Eagle and Casey Camp-Horinek, two of the leaders who are mobilizing their tribes along the length of the pipeline. Camp-Horinek is a member of the Ponca tribe, which was forcibly relocated from Nebraska to Oklahoma in 1877. The pipeline, which originates near Lameman’s reserve, will carry tar sands along the very same path as the Ponca Trail of Tears. Camp-Horinek sees this as a direct affront to her people’s memory. And each of the women consider the tar sands a threat to their sacred land. Camp-Horinek wears her graying braids down over her shoulders, a black shawl, and earrings, round like suns. Lameman is perhaps 30 years younger, with lipstick, outrageously long eyelashes and hair down to her waist. Despite the age difference, they’re both emblematic of the indigenous women leaders who are serving as mentors, organizers and spiritual leaders to their communities. They speak deliberately, as if their words matter. They do not say “um” or “like.” They sit up straight and laugh often. 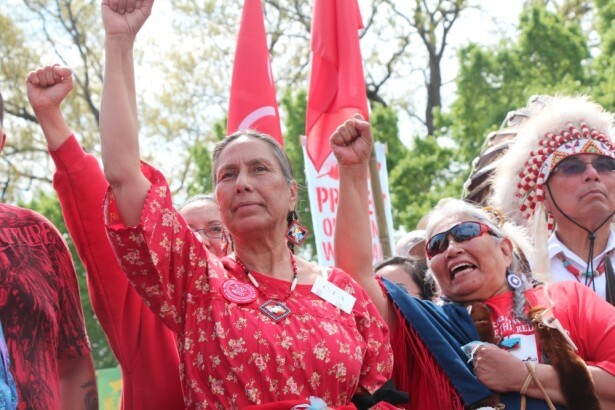 Both women’s tribes — along with the Cowboy Indian Alliance — are some of the signatories to the International Treaty to Protect the Sacred from Tar Sands and Keystone XL. 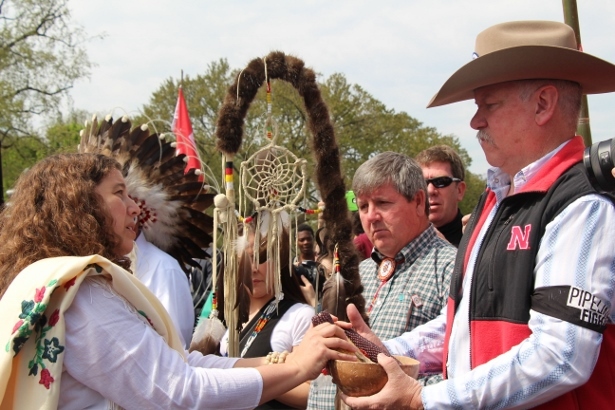 In a show of defiance and unity, several tribal councils in the United States have also passed individual resolutions condemning the Keystone XL. And Idle No More, a grassroots indigenous rights movement that sprang up suddenly in Canada during the winter of 2012, now has 700 chapters in eight countries. Thanks in part to the rise of digital networks, indigenous peoples today are reaching out to each other in ways that were unthinkable even 15 years ago. Each morning, the Reject and Protect encampment opened with a ceremony around the sacred fire, which was kept burning throughout the week. As smoke drifted up into the morning sun, the circle of participants — indigenous, white, young and old — would stay quiet as an elder offered a prayer. What most don’t realize is that this would have been impossible until fairly recently. Native ceremonies were illegal for most of the 20th century as part of the U.S. government’s effort to hasten assimilation by suppressing native culture. American Indian spiritual practices were only protected by federal legislation in 1978. The tribal elders have brought ritual to the Cowboy Indian Alliance, rooting every gathering in native ceremony. Faith often makes progressives uncomfortable; the environmental movement, to be sure, has remained stubbornly secular in the interest of inclusivity and scientific rationality. But here, people don’t seem to mind. They’re solemn; it gives each day a rhythm, a ritual, a reminder that they’re all connected to ancestors, earth and each other. Since many of history’s most powerful social movements — from civil rights to anti-apartheid — have gained strength from a firm grounding in faith, it begs the question of whether something has been lost by remaining steadfastly irreligious. And in a country where 80 percent of the population claims some spiritual affiliation, there’s a preexisting organizational network that’s largely untapped by the environmental movement. It’s possible that the Cowboy Indian Alliance offers a glimpse into what a spiritually integrated environmental movement might look like, honoring diversity while resisting cooptation. Part of embracing ceremony is slowing down to a more human pace of organizing — one where priority is given to relationships. Naturally, the alliance organizes on conference calls and on smart phones, but they make time for in-person gatherings, some of which last for several days, where time is given to sitting around and just talking. Telling stories, introducing their grandkids, spending time out on the land. They know that an alliance like this, tenuous and young, lives or dies by the strength of its relationships. This is perhaps why the scene on that first sunny morning of Reject and Protect was so symbolic. In accordance with custom, the alliance leaders gathered before the Chief of the Piscataway Tribe, Billy Red Wing Tayac, and formally requested permission to enter Washington, D.C. — what was originally considered Piscataway territory. “Unprecedented” is a word that’s heard often in the Cowboy Indian Alliance. What most don’t realize, however, is that there is a long history of successful alliances between natives and non-natives, particularly around industrial projects that residents see as a threat to land and water. This is actually a later incarnation of an alliance that was first formed in 1987 to prevent a Honeywell weapons testing range in the Black Hills, one of the most sacred sites in Lakota cosmology – where, in the 1970s, alliances successfully fended off coal and uranium mining. In 1980, a rancher, Marvin Kamerer, hosted 11,000 visitors at a Black Hills Survival Gathering to learn about native rights, sustainable living and clean energy. According to Native Studies scholar Zoltán Grossman, similar alliances prevented a toxic waste dump on Pine Ridge and Rosebud reservations in 1990, a hog farm and coal trains in the early 2000s, and Kevin Costner’s resort complex in 2002 — to name a few. Although the alliances have generally dissolved after each campaign, each one set a precedent for future collaboration. And while they haven’t been easy, they’ve been remarkably effective. Alliances like this go unreported, Grossman believes, because “they’re more dangerous to the status quo” than stories of conflict — that is, because they might inspire people to work together. The choice to focus on the pipeline came after a spectacular failure of a political strategy in which BigGreenthrew all of its weight behind the climate bill — officially known as the American Clean Energy and Securities Act. After the bill failed in the Senate, there was widespread disenchantment with the political process, a sense that the one chance for federal legislation had been lost, that the influence of the fossil fuel industry in Congress was too great. What resulted was a shift in focus away from Washington and toward local fights over coal, oil and natural gas — and a recognition that a movement isn’t really a movement unless it’s led by its grassroots base. Enter Keystone. This was everything the climate bill was not: concrete, and easy to understand and get behind. And by physically connecting impacted communities in America’s red state heartland from Alberta to Texas, it also offered a way to connect them through shared opposition — and, ultimately, shared values. Since then, some mainstream environmental organizations have begun to step back and allow environmental justice organizations to come to the fore, something that Kowalski says hasn’t always happened. “The indigenous people who are here have been doing this longer, and in a more heartfelt way, than any of us can imagine, on the frontlines of this fight,” Kowalski said. Ultimately, though, there’s only one person who will make a decision on Keystone: President Obama. And so on Wednesday, April 23, nine leaders from both the cowboy and tribal contingents met with three staffers from the Obama administration to ask the president to reject the pipeline. There was a buzz in the air at the encampment when they returned— Camp-Horinek, Faith Spotted Eagle and their compatriots were still charged from the encounter. Tribal relationships with the United States government have, for obvious reasons, been fraught with bad feelings. Centuries of land theft, racism, genocide and forced assimilation cannot be erased overnight. The cowboy contingent stayed, wanting to take advantage of this chance to tell their stories – hoping that some part would make its way up the ladder. But they left feeling equally discouraged. The distance between Washington and Nebraska seemed great indeed. 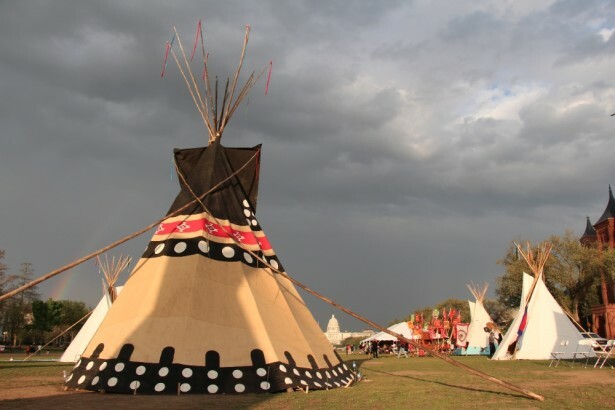 The elephant in the room — or, in this case, the tipi — is the problem of land ownership. What happens when a rancher speaks of “my land” or “my private property” to a room full of people who believe that the land was stolen, and never really belonged to them in the first place? How to begin to address the competing claims to land that is central to the identity and culture of both groups? The Cowboy Indian Alliance doesn’t seem ready to address this in public just yet. There are speeches, expressions of gratitude, fortitude, even love. The wounds of history are alluded to, but obliquely. For now, at least, these questions are secondary to the urgency of fighting the pipeline. “The land doesn’t belong to us — we’re just caretakers” is a sentiment that’s frequently heard. Behind closed doors, however, at the first meeting of the alliance, the tribal elders laid it all out. As much as the alliance represents a step towards healing old wounds, it remains just that — a step. As a movement, said Thomas-Muller, “we need to develop an organizing framework that effectively addresses racism, oppression, misogyny and colonialism.” That work is beginning, he believes, but there’s a long way to go. While any real dialogue about colonialism has been set aside for the moment, it has by no means disappeared. Grossman, in his study of history’s successful alliances, writes that this may not be a bad thing; that the “conventional wisdom” which tells coalitions to emphasize sameness, to downplay the native rights issue in favor of unity, is ultimately self-defeating. “And the response should be: we’re not going to go home until everyone has their demands met,” he said. Maybe their next meeting at the White House will be with Obama himself. And maybe then, if they decide to walk out, they’ll walk out together. In 1882, Bob Allpress’ great-grandfather built his homestead on a patch of land south of the Keya Paha River on what was then Lakota land. The land rolls under a wide sky, the hills curving like muscles of the earth. In 1886, the Lakota signed a treaty with the U.S. government, and were relocated to reservations on the other side of the river. According to family lore, though, Allpress’ family maintained good relations with their Lakota neighbors. His great-uncle and grandfather both spoke fluent Lakota. One hundred and thirty years later, the Allpresses invited members of the budding Cowboy Indian Alliance, including Faith Spotted Eagle, to their farm. Allpress thought there might be sacred sites somewhere on it; he’d found beads and arrowheads. Spotted Eagle, gazing over the rolling landscape, pointed to the highest ridge and told the others what she knew: that this was a burial site, sacred ground. This, of course, is what brings these cowboys and these Indians together: land. For some landowners it’s merely a problem of property rights. For most, though, it goes far deeper, down below the grass and soil to the very roots of their identities as either cowboys or Indians, to a sense that they are irrevocably tied to this land, that if you poison it, that they will be poisoned too. This is why a concurrent event — to Reject and Protect in Washington — took place in Red Shirt, S.D. : a three-day nonviolent direct action training, preparing participants to physically block TransCanada’s bulldozers. It was part of a series of trainings in Lakota territory called Moccasins on the Ground that have been happening for over a year in anticipation of Obama’s pipeline decision. “We cannot sit and wait for his decision,” the website says. “We must act now and be ready to protect our sacred water, our lands, our families.” Keystone XL — and industrial projects like it — have truly engendered a unity among indigenous peoples across North America that is unprecedented in any era. Meanwhile, when the tipis were rolled back up and the week-long event came to a close, landowners like Jane Kleeb of Bold Nebraska, weren’t thinking about a vacation. They’ve got plans too. On June 20, TransCanada’s pipeline permit will expire in South Dakota – which means that, along with Nebraska, it will be the second state where regulatory holdups are delaying the pipeline. She’s got a long list of rallies, political campaigns and court cases to organize around. For the moment, Obama’s decision has been delayed until after the November elections. For Kleeb, this is more time to grow the movement. But mostly, she wants to build. “It takes out a lot of you to be fighting all the time — to be in the ‘warrior stance,’” she said from her car, on her way to a meeting with reporters. According to Kleeb, the focus, post-Keystone — no matter the decision — will be on constructing small clean energy projects, like the Build Our Energy Barn, constructed by volunteers in the path of the pipeline and powered by wind and solar. “Farmers and ranchers and tribes are very self-reliant,” she said, and will want to generate their own energy that doesn’t rely on imported fossil fuels. There is an old Lakota prophecy of a black snake, a creature that would rise from the deep, bringing with it great sorrow and great destruction. For many years, the Lakota people have wondered what the prophecy meant and when it would come to pass. When they heard news of this pipeline – this tube, immeasurably long, that would pump black oil through the heart of this country — some Lakota people began to wonder if the snake appeared at last. These cowboys and Indians believe they will win. But what then? Will this alliance fall apart, as others have in the past? If they defeat this black snake, what happens to the other black snakes, in other back yards, to the network of pipelines that are spreading across the land like veins? Will the relationships last? There is another prophecy that is also spoken of by tribal elders from different nations: the prophecy of the Seventh Generation, which, loosely put, foretells a time when young people would lead an uprising, joining with other peoples to defend land and allow humans to continue living on the earth. Kristin Moe wrote this article for YES! Magazine, a national, nonprofit media project that fuses powerful ideas and practical actions.  Kristin writes about climate, grassroots movements, and social change. Follow her on Twitter @yo_Kmoe.